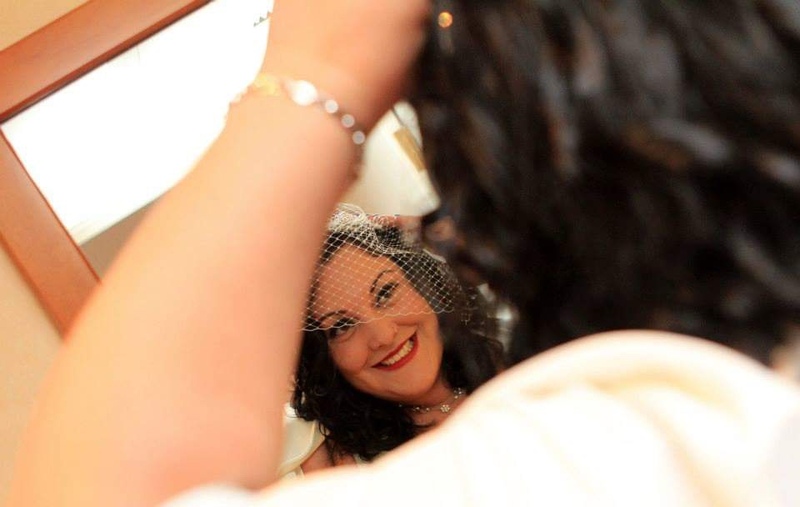 This week’s Behind the Bride is with Beccy from Raucous by Nature! Hi Beccy, first of all, congratulations on your marriage! When was the big day? We got married on May 4th 2013. The other half is a big Star Wars fan. We actually met online – on a dating website. He mentioned a film called Hot Rod in his dating profile which was a favourite of mine and a very specific type of humour – it’s written and starred the team behind The Lonely Island, so I knew we would a fun date whatever happened! We meet at a pub called The Orange Tree in Leicester in March 2011. He had planned to propose to me on our 2 year anniversary, we had planned a trip to Rome, but he actually proposed to me on Valentines Day a month or so earlier. The local comedy festival was on and we had gone out to see some acts at a local bar and were quite intoxicated and the comedian at the time was making jokes out it being Valentines Day and was referencing Beyonce’s Single Ladies, saying if you like it you shoulda put a ring on it to which my now husband thought…I do like it…I should but a ring on it and proposed without my actual engagement ring and cheap costume jewellery one I was already wearing. He did get down on one knee again in Rome though. We got married at Normanton Church on Rutland Water – we’re not particularly religious and didn’t want a church wedding although I love the architecture of churches. Rutland is about 40 minutes away from us in Leicester and when they created the reservoir they raised the floor of the church to save it as a point of interest and it’s out on the peninsular of the water which made for some lovely photos. We had the reception at an old cinema house and dance hall back in Leicester so put a coach on to ferry our guests around. We did have a theme, I brought a gorgeous pair of red and blue irregular choice shoes which I had planned to wear so set our carnival theme around that – only to decide I didn’t want to wear them after all as they made me taller than my husband. I did get another pair of Irregular Choice shoes though which did fit the colour scheme, so all was not lost! My husband has been in bands since he was a teenager and he wrote me a song as part of his speech. I was an absolute mess and was extremely grateful for the waterproof make up I was wearing! I also loved the drive from the ceremony to the reception – it gave us some one on one time right after our vows to process everything, plus we got an amazing red cadallic and luckily the rain held off so we could keep the roof down. Yes! I had planned to go to a salon to get my hair done in the morning so I could get out and have some time away from the chaos of all my bridesmaids etc getting ready and when I arrived at the salon, the girl who was supposed to do my hair was off sick! Another stylist tried several times to recreate what I wanted (a barrel roll in my fringe) and was unable to do it. I left the salon in tears but one of my friends came to my hotel and helped me do it instead. The one thing I regret not getting is a videographer, I don’t have a copy of my husbands beautiful song speech, other than one very shaky Facebook video a friend got. Try not to stress yourself out over the little details, it so easy to become wrapped up in it all you lose sight of whats important. You’re marrying the person you love, everything else is just fluff! 5 years later some of the things I thought were essential I can’t even remember. It flies by so quickly! Thanks so much for taking part, Beccy! If you’d like to see more from Beccy you can visit her blog or find her on Instagram, Twitter and Facebook. If you’d like to take part in the series, please email me. Thanks for featuring me Emma!